Although February is not typically hailed as a month for good weather, the threat of storms didn't stop some ministers from bringing the imposition of ashes outside and into the streets. While Conference Minister and President Jim Antal offered ashes to fellow protestors in Washington DC, the First Congregational Church of West Springfield stuck closer to home. The Pastor, The Rev. Ms. Jan Powers, and three deacons stood in their church parking lot and offered "Drive-Up" imposition of ashes. "I heard about another church outside New England who offered this service, and the 'heart' logic made sense to me," said Powers. "There are oodles of people who are baptized as infants and at some point stopped attending worship; yet we know that many of them still believe in a higher power and their longing for learned rituals lingers." "On Ash Wednesday, we remember our humanity, the frailty of the human existence, and the temporal nature of our bodies. We have a Lord who understands the human condition," said Powers. "It seems the perfect opportunity to make sure that people who were baptized but are not active in the church have a way of saying hello to God. We are opening a window to let God touch them, without their having an expectation that they owe anything in return." © 2013 The Republican Company. All rights reserved. Reprinted with permission. The results were inspiring. Two dozen cars, holding three dozen people, pulled into the drive-thru area. One car, with a handicapped card hanging on its mirror, held two women who both had recent knee surgeries. They were grateful to get their ashes because they didn't think they could physically walk into the church. Another car was driven by a young woman who had an infant in a car seat in the back. She asked to have ashes imposed on her child. There were even a few walk-ups. "At first I wondered if the public was going to love it or hate it," said Deacon Gina Girouard-O'Neill. "But it turned out to be an immensely fulfilling experience because so many people were grateful to have this convenience. We heard comments that people would have skipped the ritual altogether because of a commitment of picking a child up at an extracurricular activity. One person recently had a transplant and was concerned about having a compromised immune system and being in a group of people. So many people who would have otherwise stayed at home were able to come and have an interaction and experience that ashen cross reminder of who we are." "People were so very touched and grateful," said Powers. "Most of the people who came through are not active in our church. It was just heartwarming to know we could do this for the community - not as a campaign to grow the church, but because it was the right thing to do. And the only change we will make next year is to have a drive-up service early in the morning for commuters heading to work." 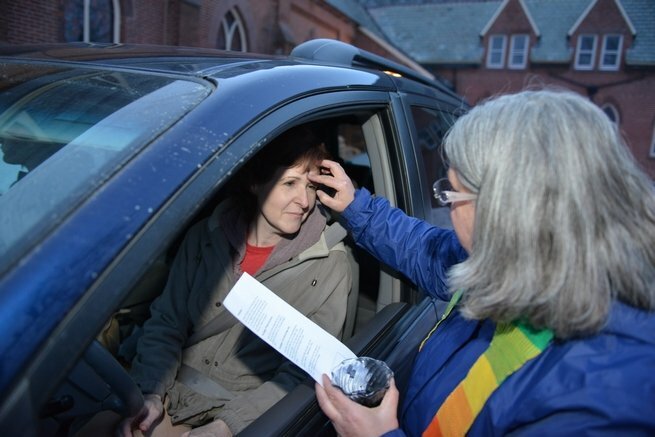 The church offered two events on Ash Wednesday. The first, a drive-up from 5:30 to 6:30 PM, was aimed at workers headed home, and others who may not participate routinely in a church. The second was their usual brief worship service held in the sanctuary, which began at 6:35 PM. They promoted the event in local newspapers and on their church sign. Unfortunately they did not add "PM" to the sign time, and several cars showed up before 6:00 AM. Powers noted that the event was 'double inspiring.' "The imposition of ashes is a humbling, sobering reminder of our frail humanity. But this experience itself was humbling to us as a church; it helped us realize that we need to think outside the box, outside the walls, and reach into the community to meet their needs, without judgment - just honest hospitality and love." Rev. Powers can be reached at the church office at phone 413.739.6608 or firstchurchws@yahoo.com.